← Ethical conflicts and moral distress in the NICU, are they all bad? In 1978 Lu-Ann Papile published a landmark article detailing the incidence of intraventricular hemorrhage (IVH) in 46 VLBW preterm infants using CT scanning, describing the differing extent of hemorrhage that may be seen, and developing a grading system (there are over 3,000 citations to this article!). To recap, for those who don’t know, a grade 1 ‘IVH’ actually does not have blood in the ventricles, but rather in the germinal matrix region, also known as a GMH or an SEH (sub-ependymal hemorrhage). A grade 2 hemorrhage is bleeding into the ventricles without dilatation, a grade 3 is hemorrhage distending the ventricles, and a grade 4 is bleeding into the substance of the brain (with or without blood in the ventricles). With the advent of head ultrasound more frequent and less invasive imaging became possible, and most centers adopted the Papile classification for grading hemorrhages seen on ultrasound. There are several problems with this system, one is the definition of a grade 3 hemorrhage, as many people seem to think that a grade 2 hemorrhage which is followed by early post-hemorrhagic dilatation becomes a grade 3 hemorrhage. It is clear to me from the original description that a grade 3 hemorrhage is one where the ventricles are acutely dilated by the hemorrhage, even though in the original article this is called “intraventricular hemorrhage with dilatation”, the image shown is one of acute hemorrhagic dilatation of the ventricle. The early studies by Joseph Volpe’s group made this clearer by referring to grade 3 hemorrhages as those where “IVH completely filled and distended at least one lateral ventricle” (their articles don’t use a grade 4, more below). This makes it very difficult to interpret and compare studies which include ‘grade 3’ bleeds, as it is sometimes unclear whether the hemorrhages are grade 3 as I understand them, or whether they are grade 2 hemorrhages followed by ventricular dilatation, which is often transient. A bigger problem is the use of the term ‘grade 4 IVH’. Parenchymal echodensities without intraventricular blood are often not actually bleeds, and frequently resolve completely, there being a high degree of inter-rater variability in their diagnosis and interpretation. Many intraparenchymal bleeds in the preterm are associated with an ispilateral intraventricular hemorrhage, and have a somewhat heterogeneous appearance on ultrasound. Such hemorrhages are often called Peri-Ventricular Hemorrhagic Infarction (PVHI) and they are not all equal, they may be small or enormous, unilateral or bilateral, and should not be lumped together in outcome studies. A classification scheme was developed in 2006 (also from Volpe’s Harvard group) to address the severity of the lesions. Bassan H, et al. Ultrasonographic features and severity scoring of periventricular hemorrhagic infarction in relation to risk factors and outcome. Pediatrics. 2006;117(6):2111-8. This classifies PVHI into 4 grades, depending on whether it is bilateral or unilateral, the extent on the worst side, and whether there is a midline shift of the brain. 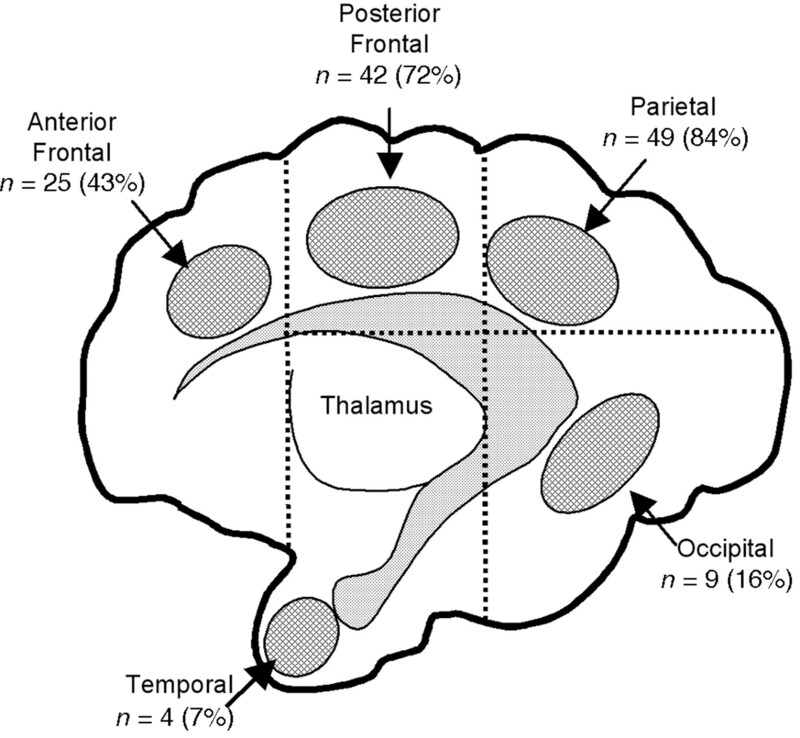 Extent is graded by dividing the brain into 5 zones by drawing lines around the thalamus. This figure is from the article referred to above and shows the percentage of PVHI affecting each zone, the numbers add up to more than 100% because a PVHI may, of course, affect more than one zone. In this scoring scheme, if the PVHI involves just one zone it scores 0, if more than one zone it scores 1 (if bilateral it scores 0 or 1 according to the extent on the worst side). The same goes for the other features, scoring 0 or 1 depending on whether the feature is present or not (bilateral, and midline shift, earning a 1 each). The severity score can therefore range from 0 to 3. It is a slightly confusing system as a unilateral PVHI without midline shift affecting one zone is referred to as a PVHI severity 0. In most scoring systems for other diseases a grade 0 means that the disease is absent. In this system a severity score of 0 does not mean that, so you have to remember this feature of the score. In the original report about 3/4 of the PVHI were unilateral, and about half of the unilateral PVHI affected one region only. In the original report the long-term outcomes reported were death, Ventriculo-peritoneal shunt, seizures (during the NICU stay or in the first 5 days after the PVHI), microcephaly, and neuromotor signs at follow-up at more than 12 months of age. Early seizures, death, and neuromotor abnormalities were all more common as the score increased, but those with more severe scores were more likely to have a redirection of care, and most of the deaths were associated with provision of comfort care. 8 of the 12 infants with a PVHI which scored 0 had a normal motor examination at 12 months. The same authors provided more detailed developmental outcome data in what appear to be the 30 survivors of the same babies, in a 2007 article. The babies were examined between 12 and 66 months of age. There was a progressively increasing proportion of the survivors with abnormal scores (<-2SD) on the various subscales of the Mullen scales of early learning with increasing scores on early ultrasounds. Most of the babies with a severity score of 0 did not have abnormal results on any of the scales, apart from gross motor where the proportion was 50%. I think this should have led us to abandon the Papile classification, which was an important advance when it was described, but was a descriptive scale and was not related to any long-term data. It is clear that there is a huge range of different severities of imaging abnormalities which are hidden by the use of the term “grade 4 hemorrhage”. We should be referring to intraparenchymal echodensities for those cases where they are not clearly PVHI, in particular those echodensities without intraventricular or at least subependymal blood. When a PVHI is present a scoring scheme such as the Bassan scheme should be used. Much larger studies could then give us a better idea of what the true range of outcomes is likely to be for each early appearance of the brain, whether having 3 zones affected is worse than 2, whether the volume of brain affected might be better than just dividing into zones (as a small hemorrhage which crosses zone lines might be less problematic than a large hemorrhage confined to one zone) and so on. In the next post I will try and review the literature to see how much data of that sort is available. This entry was posted in Neonatal Research and tagged Ethics, intracranial hemorrhage, long term outcomes. Bookmark the permalink. I totally agree with you, Dr. Barrington. I found really important the point you made by saying “The way I understand grade 2 intraventricular hemorrhage… “, I think is the way we all have to see it. sometimes that point is a cause of discussion and even, a source of bias in research. If there wasn`t the way you just post it, then we’re never able to see posthemorrhagic hydrocephalous in grade 2 hemorrhages, what is not the case. I am working on part 2 of this, and I am going to reference your work!